M.E. Widmer, a “Punkymom” living in Central Florida, took control of her destiny and self-published this fantastic new children’s series. It has a macabre quirkiness and some unforgettable characters that follow the likes of Tim Burton. 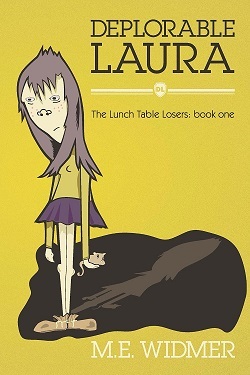 Deplorable Laura is the first book in the Lunch Table Losers series. They are appropriate for kids ages 7-10, but kids as old as 12 or 13 will enjoy reading as well. Widmer’s love of poetry, creative language and unconventional characters were inspired in childhood by her favorite authors, Shel Silverstein, Dr. Seuss and Raold Dahl. Visit her author page to learn more about her and her series of books.